What a great post! I loved your 'quilt show' as you showed many I hadn't seen yet. And congrats on your entries - SO COOL! I love that you entered the back of that one!! ;-) Thanks for the tips too. Even though I've been once, it's good to hear others' perspectives. Thanks so much for sharing! 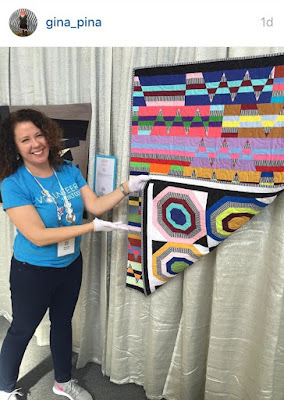 Thanks so much for sharing all these gorgeous quilt photos and your thoughts on Quilt Con. I've never been to one so it's great fun for me to read your thoughts. I'm not sure I will ever attend QuiltCon or even have a quilt entered! But I do love seeing the beautiful quilts and your post showed them so well! Thank you for being the unofficial photographer!! It was such fun to see the beautiful quilts again, Cindy. It was such an amazing display. I hope that the staff can read your ideas and make improvements for future shows. It's so nice to see more of the quilts from the show. Thanks for sharing. After attending last year, I feel like the connections to real people is a huge part of going to QuiltCon. I'd be happy hanging out with people and a few lectures and no classes at all. I hope to go to Savannah. The hubs and I are trying to decide if it could be turned into a vacation for us. A few days for me at QuiltCon and then on to other things with him. Thanks for taking the time to post all of that Cindy. I clicked on the link and looked at the winners, and although some caught my eye, I found your display far more interesting. Love your quilts and they are big winners in my book. Thanks for this, Cindy - wonderful shots of quilts, many of which I didn't capture, so that is fun. I hear you on the Introvert exhaustion. It's a LOT. QuiltCon was definitely a great time - one that I will not forget! Though I'm sure many love to see pictures of the quilts, (and I don't mean to be a buzzkill over this), did the makers give permission to post? I only mention this because our guild is facing this issue, and trying to come up with a policy regarding quilt photos online. And I know there are several famous quilters who do not want their work online. Thanks for sharing all those lovely quilts! 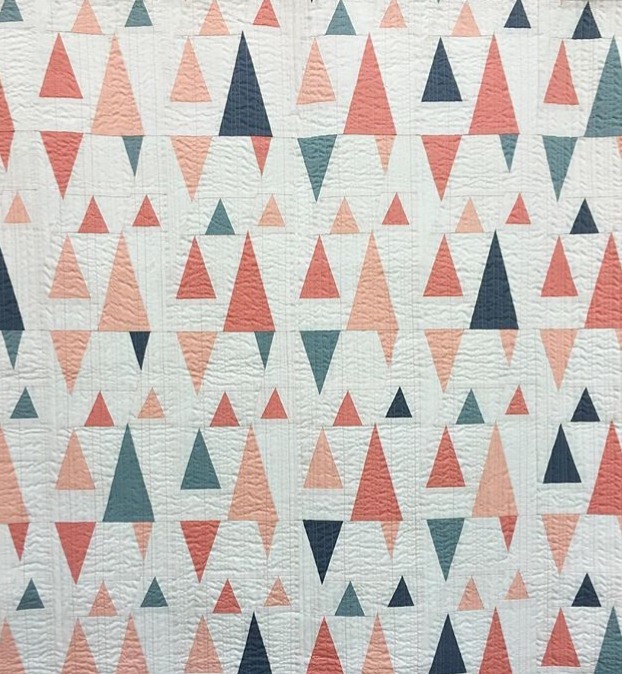 Loved your wrap up here and many of the quilts I had not seen on IG. I am planning on going to QuiltCon next year and it will be my first. So I am anxious to see who will be teaching but not to over book. Lots of good advice. Thank you so much for sharing your photos and your experience. I really enjoyed many of the quilts you posted, including yours. I would have loved to have been there... next best is seeing all the photos from the event! So sorry that next year takes QuiltCon back, away from the West Coast. Thanks so much for sharing Cindy! I looked across the room during the Diversity panel and was amazed to see you - just like in your pictures! I was going to come over but the next time I looked, you were gone so I was disappointed - just wanted to say how much I enjoy your blog and look forward to Thursdays! I ended up with a half day class (from the waiting list), a full day class (from the waiting list) and two evening classes. I too was dreading the evening classes (morning person) but all my classes were about straight and FM quilting and so it wasn't too bad. I learned a lot. I was so lucky to have classes with Angela Walters, Jacquie Gering and Christine Camilleri. One of my evening classes with Shea Henderson (The Big Finish) was way too short - she had a lot to offer and should have been in a full day class. I think I would do the same registration again and then cancel if I thought it was too much - the way the registration works, it's hard to know what you're going to get so you just have to go for it. To Susan above, I thought the quilts that were picked for the judging were on the far side of the modern quilt genre. I think the pictures in the blog are very representative of the show but perhaps not so much of the whole movement. I belong to the Sacramento Modern Quilt Guild in Sacramento partially because part of the ethic of the Modern Quilt ethic is accepting lots of different kinds of quilts and not judging. That's also what I saw from the teachers at QuiltCon too. The mantra from the classes - A finished quilt is better than a perfect unfinished quilt!" Thank you for all these lovely photos. I keep seeing more quilts that I haven't seen elsewhere. Your own quilts certainly deserve to be there. They are all gorgeous. Yes, you included my favourite in the photos above. I love the Double Wedding Ring by Tara Faughnan. I love all the colour in it, and the fact that it's hand quilted. I didn't know about Tara until I started seeing the photos from QuiltCon, but I've started following her on IG now. I wish to thank you so very much for sharing your experience at QuiltCon Cindy. I will never get there and you have inspired me with your own work (bravo) and all the exhibitors here. I was able to enlarge your wonderful photos and see a lot of the quilting. Incredible. Never will I manage such wonders but I due get excited trying something on my own scale. And isn't that what it's all about! Thanks again for all your work with your blog, I always look forward to it and know that it takes work. You are appreciated Cindy, very much so. I love hearing everyone's thoughts on QuiltCon. This was my first time, and it was delightfully overwhelming! I ended up taking two three hour classes during the two and a half days I was there, and that felt about right. It would have been nice to have another half day to walk through the vendors again and see some demonstrations so next time I may be looking at an extra day. Thank you so much for sharing my quilt! What a great wrap-up of the show. It's such a BIG show, with all that's going on! I'm so glad I got to experience it with a very kind and sociable friend, or I would have felt overwhelmed and lost, as described by another Linda in earlier comments. Thanks for doing the work of posting so many great quilts, so many of my favorites, too! Great wrap-up and great points about the show. 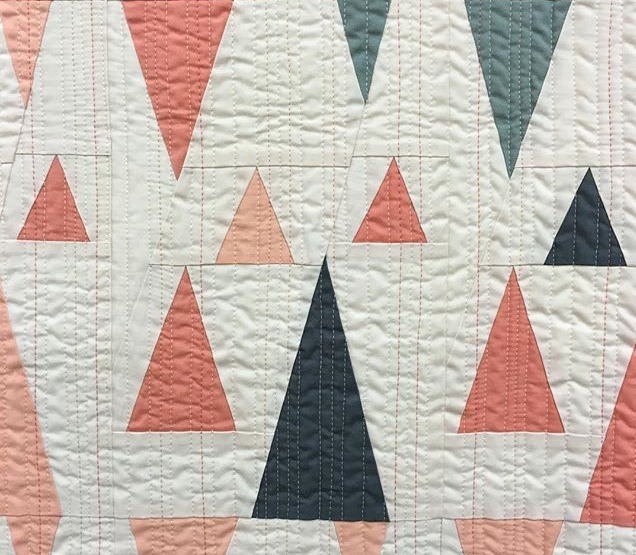 I love seeing everyone's post as they show quilts that I didn't see (and I really tried hard to see them all!). I totally agree on that keynote thing. If it is a keynote, carve out space for it! Thank you so much for your posts - you may, at times, write a longer post but I never tire of reading the post. I can't make that same comment to all bloggers. Something happened to my iPad and this post and lots of others ended up in my trash - yikes. Again, you gave information about the quilts and your thoughts which I appreciated. I live in southern CA and so looked forward to going to QuiltCon in Pasadena. Then I got that awful crud and it wiped me out or the cough did so I missed QuiltCon. So I really enjoyed seeing the photos and comments. I like to see the prize winners but there are always other quilts which give pause and those I enjoy seeing. I see haven't figured out the "fish" one but maybe if I keep looking at it. Thanks bunches! Hi Cindy - I just ran across this post and it is so lovely to see all the quilts together like this again! And you are too sweet about your comment on meeting me :) ha ha! It was so great to meet you, and I hope that we can see each other again at future events!